An hour before we spoke, Darragh O’Carroll, an emergency room physician from Hawaii, had just given an elderly patient a sedating shot of ketamine. The man had pneumonia and was acting confused and fidgety, making him hard to treat. Ketamine’s use as an anesthetic — and not as a party drug — is widespread, though not commonly known. In fact, the World Health Organizationestimates ketamine is the most widely used anesthetic in the world and keeps it on their list of essential medicines, a category of drugs that all developed countries should have on hand. O’Carroll has described ketamine as his “favorite medicine of all time” in an article for Tonic, not only because the anesthetic is incredibly safe and effective, but also because of its versatility. It’s most widely used in surgery, but could also help treat severe asthma, chronic pain, and may even possess anti-tumor properties. In the last two decades, ketamine has also emerged as a potent antidepressant, able to treat symptoms of some mental illnesses in less than 72 hours. “I think the more research that goes into ketamine, the more uses that we find for it,” O’Carroll says. Ketamine’s story begins with a drug called PCP. Yes, that PCP — phencyclidine or so-called “angel dust,” a drug that when smoked can cause a trance-like state, agitation and out-of-body hallucinations. After it was first synthesized by medicinal chemist Victor Maddox in 1956, the drug was briefly approved as an anesthetic by the FDA for its sedative properties. In tests with a wild rhesus monkey, for example, researchers put their fingers in the previously aggressive animal’s mouth and watched its jaw remain slack. But while it was safe and effective for pain relief, the side effects of PCP soon became too obvious to ignore. Some patients under the influence of PCP would feel like they lost their arms or legs or that they were floating in space. It could also cause seizures and delirium. Scientists began seeking a shorter-acting anesthetic without convulsant properties. In 1962, chemistry professor Calvin Stevens discovered a PCP analogue that fit the bill: ketamine. Ketamine is a potent, sedating painkiller that can cause amnesia and is mostly used in surgery and veterinary medicine. During the Vietnam Invasion, ketamine saw widespread use in the U.S. military because it has several advantages over opioids. First, unlike morphine, ketamine doesn’t suppress blood pressure or breathing. It also doesn’t need to be refrigerated, making it useful in the field or in rural areas that don’t have access to electricity. Ketamine’s benefits extend beyond use as an anesthetic, though — in some cases it can serve as a balm for the mind as well. A 2008 analysis found that burn victims who were given ketamine were less likely to develop symptoms of post-traumatic stress disorder, even if their injuries were more severe. Those findings have been replicated, such as a 2014 clinical trial of 41 patients, who saw their PTSD symptoms diminish within 24 hours, an effect that lasted for two weeks. “When somebody gets one of their limbs dramatically blown off or is shot in the face, it’s a very traumatic event,” O’Carroll says. In such a situation, giving ketamine not only provides instant pain relief, it could prevent long-lasting trauma. 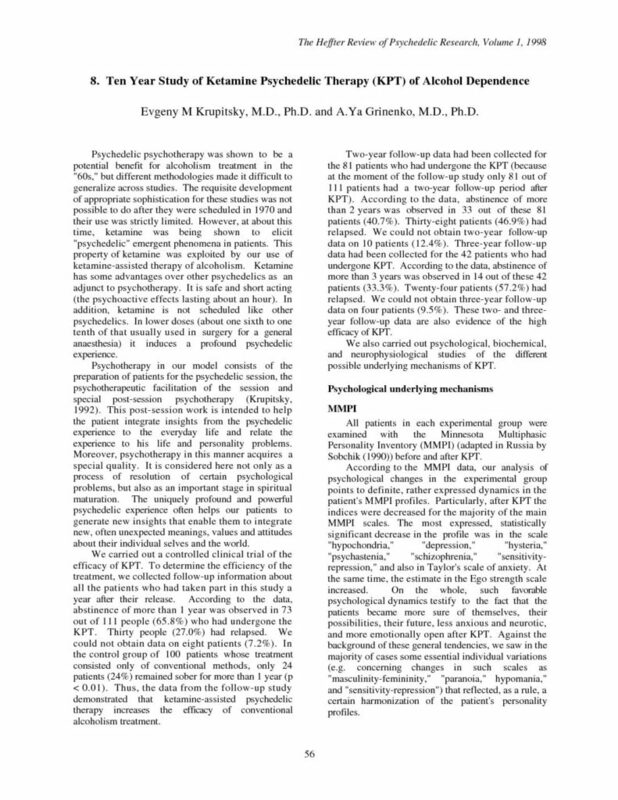 Because its chemical structure is so similar to PCP, ketamine can still give lucid hallucinations, such as feeling that your mind has separated from the body — a dissociative state users sometimes call a “K-hole.” One recent study based on users’ written reports even indicated that this kind of experience might be a close analogue to a near-death experience. However, these dissociative states only happen at high doses — the amount of ketamine used to for surgery and to treat depression is typically much lower. But ketamine’s side effects are less common and easier to manage than PCP. In fact, ketamine is one of the safest drugs used in medicine today and can even be given to young children. For example, ketamine was used to sedatethe boys’ soccer team trapped in a cave in Thailand last year. Putting the kids in a tranquilized state made it easier to rescue them, and ketamine is safer than the opioids or benzodiazepines that are also commonly used as sedatives. But it wasn’t until the 1990s that what could turn out to be ketamine’s most important function was discovered. 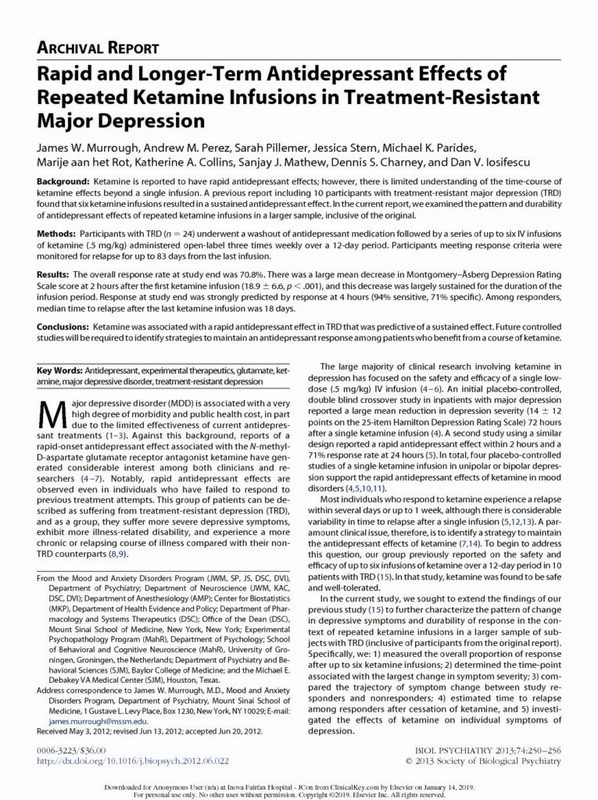 A team from Yale University School of Medicine was examining the role of glutamate, a common neurotransmitter, in depression, and discovered something remarkable: ketamine could rapidly relieve depression symptoms. “To our surprise, the patients started saying, they were better in a few hours,” Dennis Charney, one of the researchers, told Bloomberg. This rapid relief was unheard of in psychiatry. Glutamate is associated with neural plasticity, our brain’s ability to adapt and change at the level of the neuron. Ketamine blocks certain glutamate receptors, but not others, and the end effect could be to promote the growth of new neurons while protecting old ones. This could explain how ketamine can help reset the brain, though the theory hasn’t yet been definitively proven. The prescription meds currently on the market for depression have some major drawbacks. Drugs like Prozac or Wellbutrin can take a few weeks or months to kick in while worsening symptoms in the short term — not a good combination, especially for someone who is extremely depressed, or even suicidal. It took around a decade for mainstream science to take notice of these early ketamine-depression studies. But once it did, ketamine clinics began popping up all across North America, offering fast relief for depression, anxiety and other mental illnesses. Patients are given an infusion — an IV drip that lasts about an hour — and many people, but not everyone, have seen rapid relief of their symptoms. Suddenly, ketamine infusions became trendy, though the science to back up some of the medical claims is still inconclusive, according to STAT. However, ketamine infusions are rarely covered by insurance, although that is changing. A typical session can run $700, with many patients taking six sessions or more. But many of these patients have so-called treatment-resistant depression. They’ve tried other medications or therapies without success and some see ketamine as a last resort. Steven Mandel, a clinical psychologist and anesthesiologist, has used ketamine on patients since it first came on the market around 50 years ago. In 2014, he began using it for patients with depression and opened Ketamine Clinics of Los Angeles, one of the oldest and largest clinics in the country. They’ve done over 8,000 infusions so far. “Our success rate is better than 83 percent,” Mandel says. For his clinic, success means a 50 percent improvement of depression symptoms for longer than three months. Ketamine’s success as an antidepressant couldn’t help but attract the attention of major pharmaceutical companies as well. In 2009, Johnson & Johnson began developing their own version of the drug they called esketamine. Rather than an infusion through a vein, it’s dispensed through a nasal spray. The FDA approved their formulation in early March. It was thefirst drug in 35 years to fight depression using a different approach than traditional drugs. But many clinicians have raised concerns about long-term side effects, such as heart and bladder toxicity. Others have been critical of esketamine, saying there isn’t enough data yet to suggest the drug is safe or effective. Husseini Manji, a neuroscientist who helped develop the drug for Johnson & Johnson at their subsidiary Janssen, has pushed back against these claims. “When you line up the totality of the studies, it was really an overwhelming amount of data that was all in the same direction,” Manji says in a call. Though just two of the five late-state clinical trials showed significant results, the changes in mood in the three that fell short were “almost identical in magnitude” to the others, Manji says. 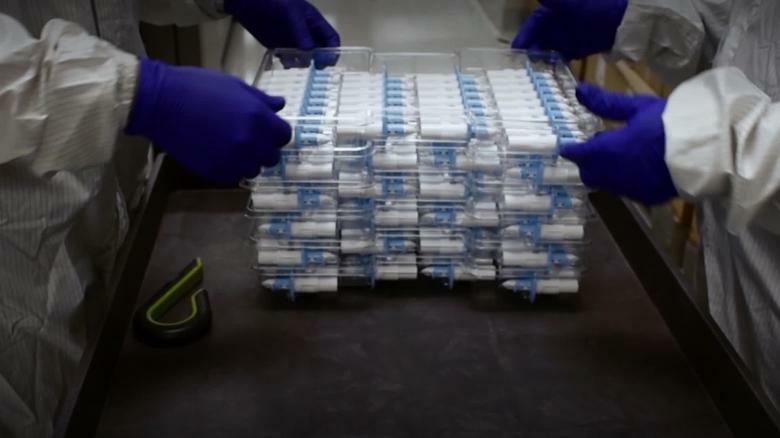 It was enough for the drug to meet standards for FDA approval. We can probably expect other ketamine-related drugs to come to market soon. ATAI Life Sciences, a company funding research on the use of magic mushrooms for depression, is developing their own ketamine depression drug. The pharmaceutical company Allergan also developed rapastinel, another ketamine-like drug, though it failed to show any real benefits for patients in later trials. Manji says this is unfortunate for people who could be helped by these kinds of drugs. Even though ketamine’s medical uses are well-established, most people have only heard of ketamine in the context of a party drug. Because of this bad reputation — and what’s perceived as growing misuse of the drug — several countries, such as China and the UK, have tried to place greater restrictions on ketamine. This would make it harder to study and more expensive in clinical use. “If it was to ever be rescheduled, places that would be first affected would be you know places that need it most,” O’Carroll says. The WHO has asked at least four times for countries to keep access to ketamine open. “The medical benefits of ketamine far outweigh potential harm from recreational use,” Marie-Paule Kieny, assistant director general for Health Systems and Innovation at WHO, said in 2015. So far, no countries have put greater restrictions on ketamine, and that’s probably a good thing. Ketamine has a rich history, but its future is still being written. A one-off dose of the drug could help alcohol addicts reduce their intake by ‘erasing’ drink-related memories, say psychologists testing treatment. Scientists believe that a radical treatment involving the tranquilliser ketamine could help overcome alcohol addiction by “erasing” drink-related memories. Psychologists based at University College London are testing whether a one-off dose of the drug could help hazardous drinkers who are trying to reduce their alcohol intake. Alcohol addiction is notoriously difficult to treat, and there are few effective therapies available. Using a recreational drug to treat addiction may sound counterintuitive, but the researchers say there is a growing body of research suggesting that ketamine can be used to disrupt harmful patterns of behaviour. Crucially, ketamine can disrupt the formation of memories, and scientists believe that this property could be harnessed to over-write the memories that drive addiction and harmful patterns of behaviour. For instance, seeing a glass of beer, hearing the clinking of glasses or even arriving home from work may trigger memories of the rewarding sensation of taking a drink – and might prompt a person to follow this urge. There is increasing evidence, however, that memories are less stable than once assumed and may be open to manipulation. Each time our brain accesses a memory, the neural connections that encode it are temporarily destabilised, meaning that our recollection can be slightly altered before it goes back into storage. This is one reason why, in everyday life, people can recall wildly different versions of the same events. In the clinic, scientists believe this short period of instability, represents a window of opportunity. Ketamine blocks a brain receptor called NMDA, which is required for the formation of memories. So the logic is that giving someone the drug just as a memory has been destabilised could help weaken the memory, or even erase it. A similar approach with a different drug was shown to eradicate people’s phobia of spiders. And research in rats that were made to be addicted to cocaine showed that the memories underpinning their addiction could be completely wiped out using a similar strategy (although this involved injecting a chemical into the brain). In the UCL trial, the scientists will intentionally trigger alcohol-related memories by placing a glass of beer in front of the participants, who are all heavy drinkers. They will then disrupt the memory, by surprising the participant (the team is not disclosing the exact details as this could bias the results). Participants will then be given either a ketamine infusion, with a concentration equivalent to a high recreational dose, or a placebo. The team will follow up the people for a year and monitor whether their drinking has changed and by how much. Nikki, 31, who works as a consultant in London said she decided to take part in the study when she had some time off between jobs and realised she was drinking more than she wanted to. “It’s just in the culture, that’s what all my friends are like. Everyone drinks to excess,” she said. In the week after the session, she said, she felt in an “incredibly positive mood” and that since taking part she has been more conscious about deciding whether to have a drink, although said this could also be linked to starting a new job and taking up meditation. “In the past, there were occasions where I would be drinking and I’d be on autopilot ‘Let’s get another drink’,” she said. If the trial yields promising results, the team hope that the approach could form the basis for therapy sessions targeted at alcoholics and people who are drinking unhealthily. However, they acknowledge that there may be resistance to the use of a recreational drug to treat people with addiction. However, he added, no drug-based therapy is risk-free “and that certainly includes ketamine”. January 2018 has come to an end and with it the month that people increasingly use to abstain from alcohol. It is still unknown whether Dry January has a lasting effect on drinking behaviours, and people with an alcohol dependency problem should always seek support from their GP before going through detox. Nonetheless, Dry January undoubtedly drives a critical conversation about alcohol use and provides an opportunity for us to reconsider our relationship with alcohol (one of the main goals of the charity Alcohol Concern, who support the challenge). While overall alcohol consumption in the UK is falling, alcohol abuse still represents the fifth biggest risk factor for illness, death and disability across all ages. With current treatments often failing to prevent relapse in the long term, researchers are investigating the possibility of using ketamine combined with psychological therapy to help people stay dry, and not just for January. Despite its often cited use as a recreational drug and “horse-tranquilizer” ketamine is also the most widely used anaesthetic in humans. Administered appropriately in a controlled and safe medical environment, ketamine may also have benefits in the treatment of drug problems. Say Why To Drugs – does alcohol put our health on the rocks? Evidence for this originally came from a research group in Russia in the 1980s. In this study, patients who had alcohol problems were given three weekly ketamine treatments in conjunction with psychological therapy. After one year, 66% of patients who underwent this treatment regime were abstinent, in comparison to 24% of patients who received treatment as usual, without any ketamine. This abstinence rate is much greater than those documented with any other relapse prevention method. Inspired by the promising results seen in Russia, we are now conducting the KARE trial (Ketamine for reduction of Alcoholic Relapse) at the University of Exeter and University College London. In this trial participants who have made the decision to abstain are administered ketamine once a week for three weeks. Participants also receive seven sessions of cognitive behavioural therapy to aid their quit attempt and are followed up for six months. 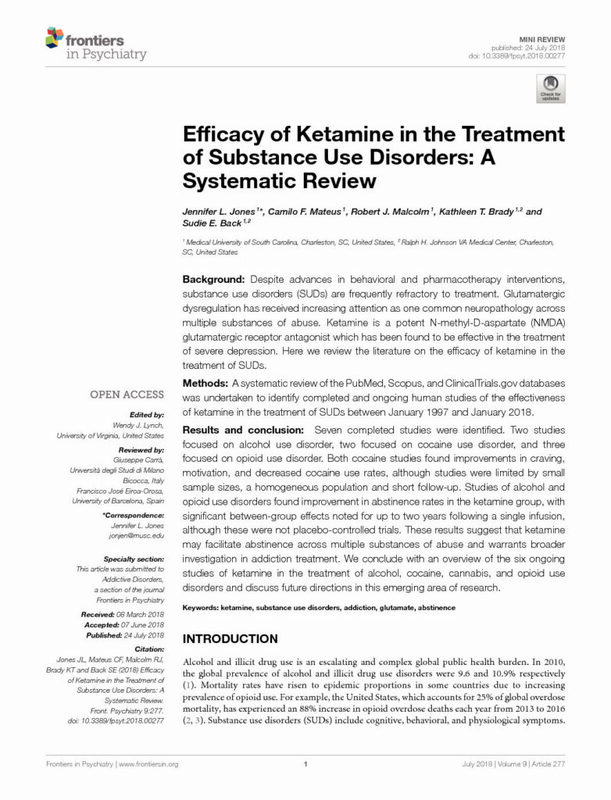 Unlike the earlier study, this trial is placebo controlled, thus participants have an equal chance of receiving either ketamine or a matched placebo as well as either cognitive behavioural therapy or alcohol education as a placebo for therapy. It is also double-blind, meaning neither the participant nor the researcher know whether the active treatment or a placebo treatment are administered. This controls for placebo effects and bias due to expectancies of the researcher – putting the original findings to the test with a more rigorous research design. Why might ketamine help people stay sober? Recent studies have demonstrated that ketamine has rapid and powerful anti-depressant properties, while people with alcohol problems often also experience symptoms of depression. 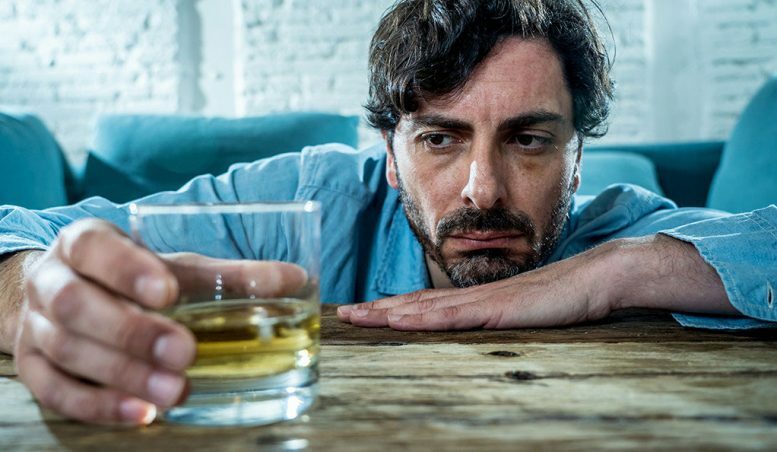 The direction of the relationship between alcohol problems and depression is not clear, but depressive symptoms are thought to be a common trigger for relapse. Treating people who have alcohol problems with ketamine, therefore, could help them to remain abstinent for longer by lifting their mood. Furthermore, laboratory research has demonstrated that ketamine promotes the growth of new neurons and connections in the brain. These processes are essential to learning and memory, and are suggested to be impaired in both depression and problematic alcohol use. Thus ketamine might make people more receptive to new information and able to plan effectively for the future, which in turn may enhance the effect of psychological therapy. We do not yet know how effective the ketamine treatment will be. However, well-designed research studies, such as the KARE trial, could be critical in helping people achieve their abstinence goals. This study suggests that ketamine can safely be used to avoid intubation and may decrease length of intensive care unit stay. Severe alcohol withdrawal, or delirium tremens (DT), is a life-threatening condition that can require massive doses of benzodiazepines or barbiturates (GABA agonists), which can require intubation and prolonged intensive care unit (ICU) care. These authors studied a retrospective sample of adult patients admitted to a single ICU with DT to determine whether adjunctive therapy with ketamine improved outcomes. They compared outcomes in 29 patients who received symptom-triggered therapy with GABA agonists with outcomes in 34 patients who were treated after initiation of a guideline that added an intravenous ketamine infusion (0.15–0.3 mg/kg/hour) to GABA agonist therapy. Using multivariable modeling that accounted for initial ethanol level and the total amount of GABA agonist required for treatment, patients who received ketamine had significantly lower rates of intubation (29% vs. 76% for patients who did not receive ketamine) and shorter ICU stay (5.7 days vs. 11.2 for patients who did not receive ketamine). There were no reported adverse events. WHEN I FINALLY HEAD OUT, IT’S CHAMPAGNE FOR EVERYBODY! AS WELL AS BOTTLES OF WINE FOR EVERYBODY! WHO WANTS THEIR OWN BOTTLE? WE ALL WANT A BOTTLE! THE NEXT DAY, I MAY BE A LITTLE TIRED, BUT IT’S OK, OFF TO BRUNCH!